The Youth Services Forum hosted a workshop and networking event on August 24, 2018. The event was filled with learning and networking and was attended by 27 youth services staff members from across Virginia. 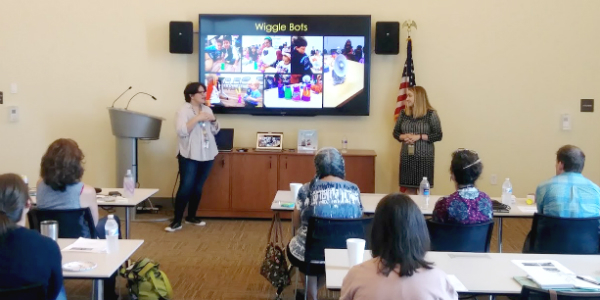 Attendees began the day by learning about STEM and STEAM programs for elementary aged patrons with two different approaches and two different ways of acquiring materials. Staff were able to bring back many ideas that could work with libraries that serve different types of patrons. The second presentation focused on unconventional programs for children and young adults, including a sewing program and chip Olympics. Our last presenter, Sue LaParo, the Library of Virginia Youth Services Consultant, brought much hope and excitement for what Library of Virginia is going to offer to support youth services across the state. Be on the look-out for emails from Sue in the future. Finally, we ended our day by networking together about program ideas. We hope to see many youth services staff members at the VLA Annual Conference in Williamsburg this year. If you attend, don’t forget to register for our networking/dinner on the dine-arounds page. Membership in the Youth Services Forum is open to all members of the Virginia Library Association with an interest in Youth Services. To join the forum, login to VLA.org and edit your profile to add the Youth Services Forum to your list of forums. Purpose: To promote quality library services and programs for all children from birth to young adult throughout Virginia. To provide members and other library staff with information about resources and programs for all children from birth to young adult. Encourage the exchange of information and ideas about library resources, programs, and concerns among those who work directly with children and/or young adults. To advocate for quality library services and programs to all children from birth to young adult. To promote reading as a lifelong and enjoyable aspect of life. Officers: Youth Services Forum officers include Chair and bylaws/Chair-Elect. The Executive Committee of the Youth Services Forum includes Chair, by-laws/Chair-Elect, Immediate Past Chair, and regional representatives. Pay Association dues by January 1 of each year in office. Attend VLA Council meetings and participate in Association affairs. Initiate and maintain communication with forum members. Plan, promote, and sponsor forum activities, continuing education programs, and annual conference programs as needed. Maintain record of forum activities; preserve and pass on to successors a record of work and activities with recommendations for change or actions. Attend Youth Services Forum meetings and participate in Association affairs. Assist chair in preparing agenda, program planning, and budget preparation. Attend at least two VLA Council meetings. Be a member of the conference committee for one year to encourage youth services participation and help with other duties as needed. Pay Association dues by January 1 of each year in office and participate in Association affairs. Attend meetings of the Youth Services Forum. Plan, promote, and sponsor programs as needed and identified through email, phone, social media, and/or in person.